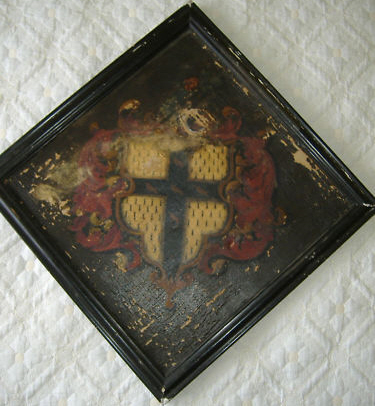 Over at the Heraldry Society of Scotland’s web forum Richard d’Apice found that the Hatchment for General Sir Henry Robert Ferguson Davie Bt for sale by auction by Aldridges of Bath. It had a guide price of between £100 and £150 but eventually sold for £1,150. The 107th edition of Burke’s Peerage & Baronetage describes Henry Robert Ferguson as the illegitimate son of Robert Ferguson of Raith. On 22nd March 1823, he married Frances Juliana, daughter of Sir John Davie, 8th Baronet, of Creedy, and niece and heiress of Sir Humphrey Davie, 10th and last Baronet, of Creedy. (Her eldest brother, Sir John Davie 9th Bt, died unmarried in 1824 and her other brother, William, died in 1822.) 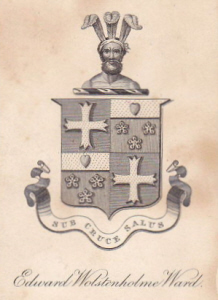 On 9th February 1846 he assumed by Royal license the additional surname and Arms of Davie and the following year the baronetcy held by his wife’s family was revived when he was created a Baronet, of Creedy in the County of Devon on 9 January 1847. The hatchment does differ from the modern blazon and is probably also incorrect in its background colours. Arms (Hatchment): Quarterly 1st & 4th Argent a chevron Sable between three mullets pierced Gules 2nd Azure three cinquefoils two and one Or upon a chief of the last a lion passant Gules 3rd three cinquefoils two and one Or on a canton Argent [details are not clear] in centre point the Badge of Ulster. Impaling: Argent a chevron between three mullets Gules. Arms (modern): Quarterly 1st & 4th Argent a chevron Sable between three mullets pierced Gules 2nd & 3rd Azure three cinquefoils two and one Or upon a chief of the last a lion passant Gules in centre point the Badge of Ulster. Crest: A pascal lamb reguardant Gules. Sir Henry Robert Ferguson Davie died 30th November 1885 with his wife predeceasing him on 12th April 1882. On that basis the right hand half of the hatchment, representing his wife’s Arms, should also have been painted black. 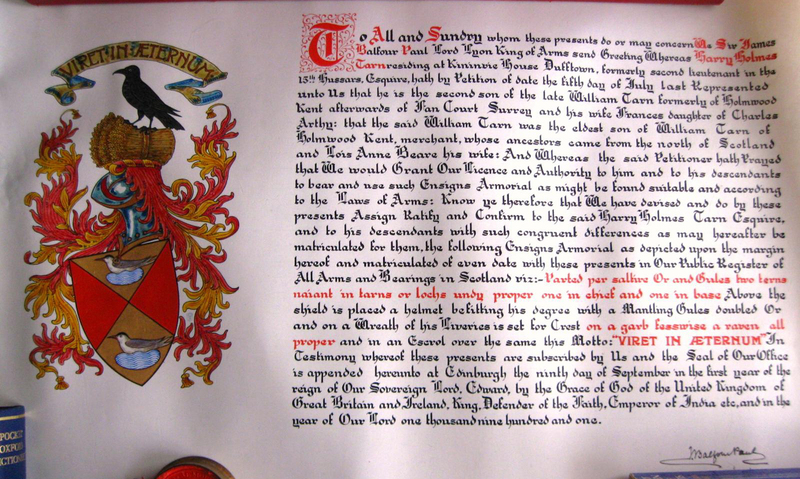 The Scottish Grant of Arms to Harry Holmes-Tarn were recently on sale on eBay. The Grant is dated 9th September 1901 and signed by Sir James Balfour Paul. Arms: Parted per saltire Or and Gules two terns naiant in tarns or lochs undy proper one in chief and one in base. 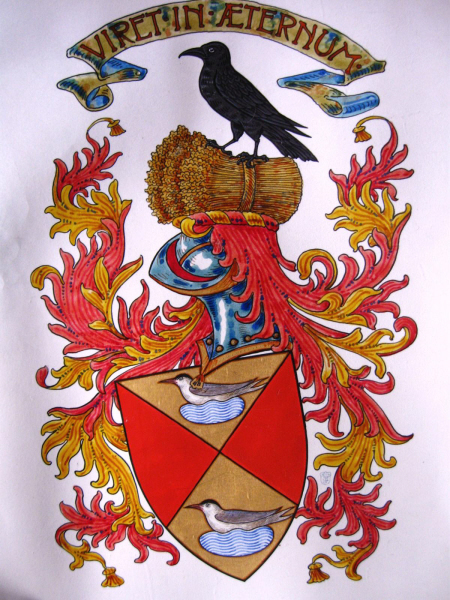 Crest: On a wreath of his liveries on a garb fessewise a raven all proper. 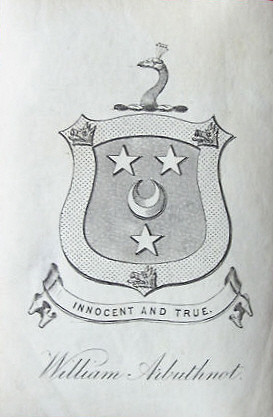 The Arms of Harry Holmes-Tarn were also included within Arthur Charles Fox-Davies 1929 edition of Armorial Families. Captain Alastair Roderick Holmes-Tarn (b.1911 d.1967) m.1948 Nancy Emlyn Gore. Neither surviving son seems to have had any issue to continue the use of the Arms. Photographs of the Grant courtesy of the vendor, Mr Ashton C Cameron Stuart. William Frederick GUSH of 53 Sussex Gardens, Hyde Park. Sable a fasces erect proper between two owls Argent a chief ermine. 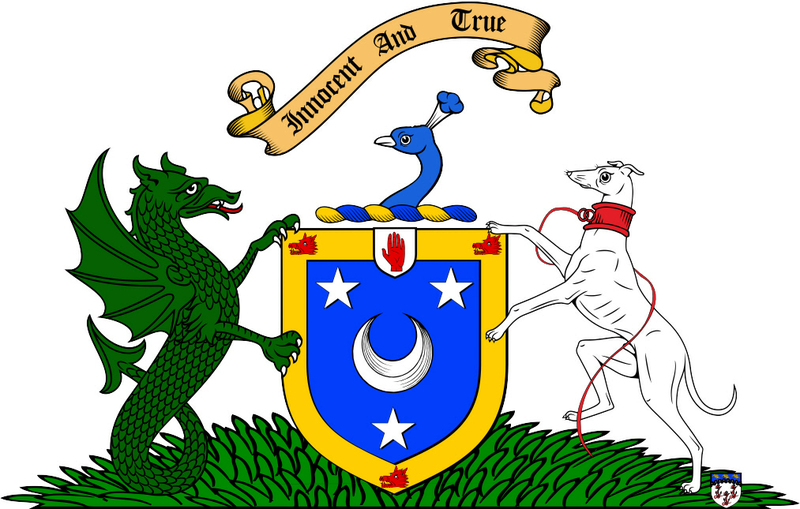 The latest addition to my online Armorial is for Brownlee. So far it just has the two Arms as recorded in Scotland in 1969 for two Australian viz: Gyronny of twelve Gules and Or in the centre a cinquefoil ermine a bordure Or for difference & Gyronny of twelve Gules and Or in the centre a cinquefoil ermine a bordure engrailed Or for difference. The two grantees were brothers and the sons of a second son. Therefore, the stem Arms for that family are most probably Gyronny of twelve Gules and Or in the centre a cinquefoil ermine. 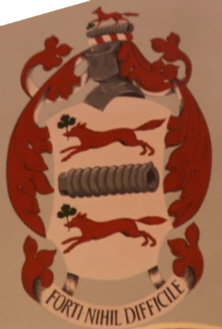 The Arms seem to be based upon those of Brounlee (Gyronny of twelve Gules and Or in the centre a cinquefoil Sable) in Burke’s General Armory (BGA). The BGA entry gives no biographical or geographical details, as such is of limited use and, of course, no authority. Unfortunately, there are various family history website that still cite BGA as an “official” record. 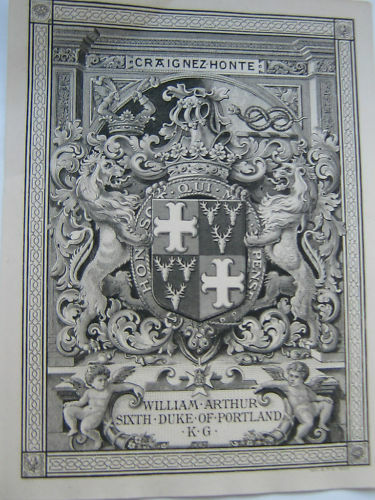 A bookplate that keeps re-appearing for sale at eBay is one for William Arbuthnot. 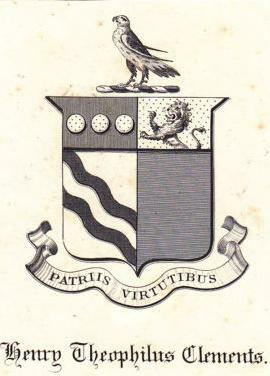 The bookplate displays his Arms before he was created a baronet in 1822/3 (Arbuthnot Armorial). Unusually, when he was created a baronet he also received supporters for his Arms. Whilst Arbuthnot was the Provost of Edinburgh the King attended a dinner. It is claimed that the King said if Arbuthnot could walk around the table unaided he would be granted Supporters for his Arms. Azure a crescent between three mullets Argent within a bordure Or charged with three boars’ heads erased Gules. Gules an escutcheon Argent between three pike-heads (or geds’ heads) couped Or. A pike’s head couped proper. 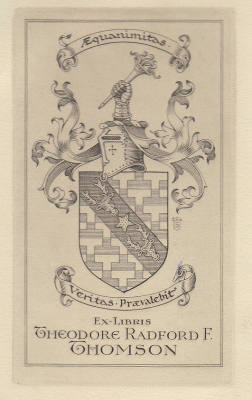 The bookplate of Theodore Radford Forrester Thomson (Thomson Armorial) is on sale at eBay. He was the youngest son of Rev. Prof. John Radford Thomson. His Arms were matriculated in the Lyon Register in 1923. His bother, Rev. Canon Clement Reynolds Thomas, matriculated Arms in 1924 (Potent Argent and Azure on a bend Sable two stags’ heads cabossed Or) and his cousin, Charles Sheldon Thomson, also matriculated Arms in 1923 (Potent Argent and Azure on a bend engrailed Sable two stags’ heads cabossed Or). 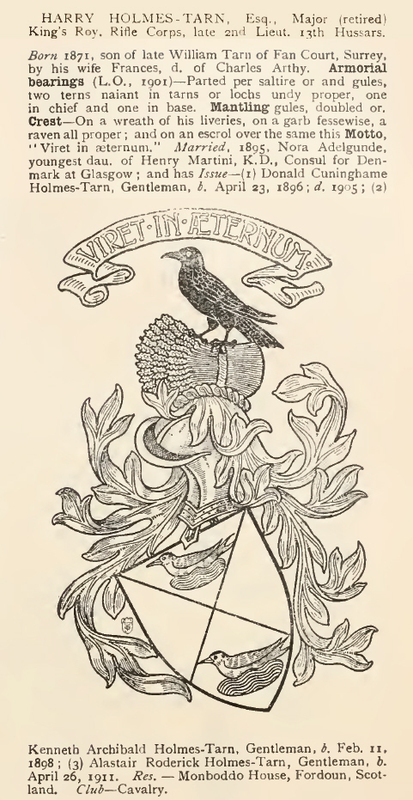 These are also noted in Arthur C Fox-Davies’ Armorial Families (1929 Edition). More family details can be viewed online at Thomson & Forrester of Corstorphine Pedigree. Another bookplate on sale at eBaythat of Maj.-Gen. Sir Edward Wolstenholme Ward. A Saracen’s head affrontee couped below the shoulders proper wreathed around the temples Or and Azure and adorned with three ostrich feathers. Sir Edward was the great-grandson of the 1st Viscount Bangor and nephew to the 3rd. The Hamilton quarter was from Anne Catharine Hamilton, mother of the 1st Viscount and daughter and co-heiress of James Hamilton of Bangor, co. Down. Another bookplate on sale on eBay is that of Lt Col Henry Theophilus Clements DL JP. However, the sale site has incorrectly identified the bookplate as belonging to Henry’s grandfather, Lt Col Henry Theophilus Clements (1734-1795). 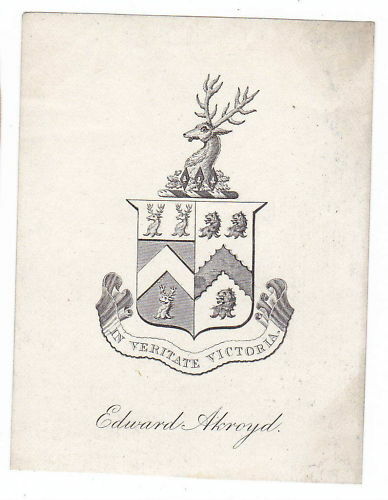 A bookplate linked to one of my Armorials has caught my eye over at eBay, that of Edward Akroyd MP JP DL of Bankfield. Edward Akroyd married Elizabeth, daughter of John Fearby of Poppleton Lodge, in 1838. Elizabeth died in 1884 and Edward died in 1887. They had no children. Azure a chevron and in base a stag’s head erased Argent on a chief of the last two stags’ heads erased of the field. 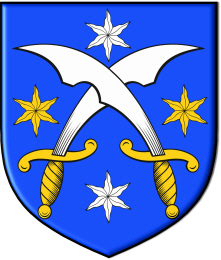 * The Arms used by Fearby are listed as Fereby in Burke’s General Armory. 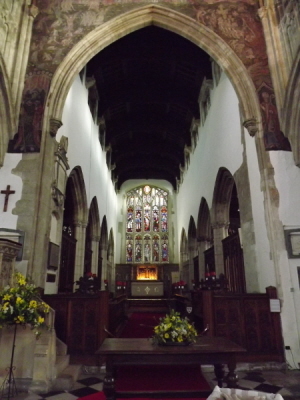 A couple of weekends ago I was in Salisbury with the family and I re-visited the Parish Church of St Thomas and St Edmund. My first visit was a bit of a failure because my digital camera died on me. However, this time armed with my new camera and in the company of my father-in-law I had more success. As a interim step I have uploaded some of the pictures to photobucket. The link below will take you to the gallery via the main website. 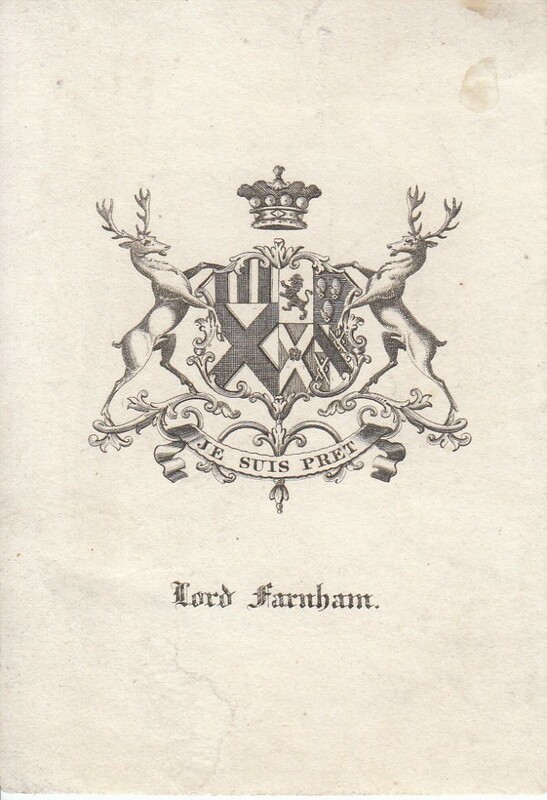 The bookplate of the 7th Lord Farnham is currently on sale at eBay by prexiepost. Henry Maxwell, 7th Baron Farnham married Anna Stapleton, daughter of Thomas Stapleton, 16th Baron le Despencer, on 3 December 1828. The couple had no children. Both Farnham and his wife were killed in the Abergele train disaster of 1868. My Maxwell armorial can be viewed at www.heraldry-online.org.uk/maxwell.html. Arms: Argent a representation of a corrugated boiler-flue fesseways proper between two foxes courant Gules each holding in their mouth a trefoil slipped Vert. Crest: A representation of a corrugated boiler-flue as in the Arms and thereupon a fox Gules resting the dexter pay upon a trefoil slipped Vert. Today a bookplate of the 6th Duke of Portland was sold on eBay by lesIndavid. The Arms are listed in my Bentinck armorial. Arms: 1st & 4th Azure a cross moline Argent (for Bentinck) 2nd & 3rd Sable three stags’ heads cabossed Argent attired Or (for Cavendish). Supporters: Two lions double queued the dexter Or the sinister Sable. 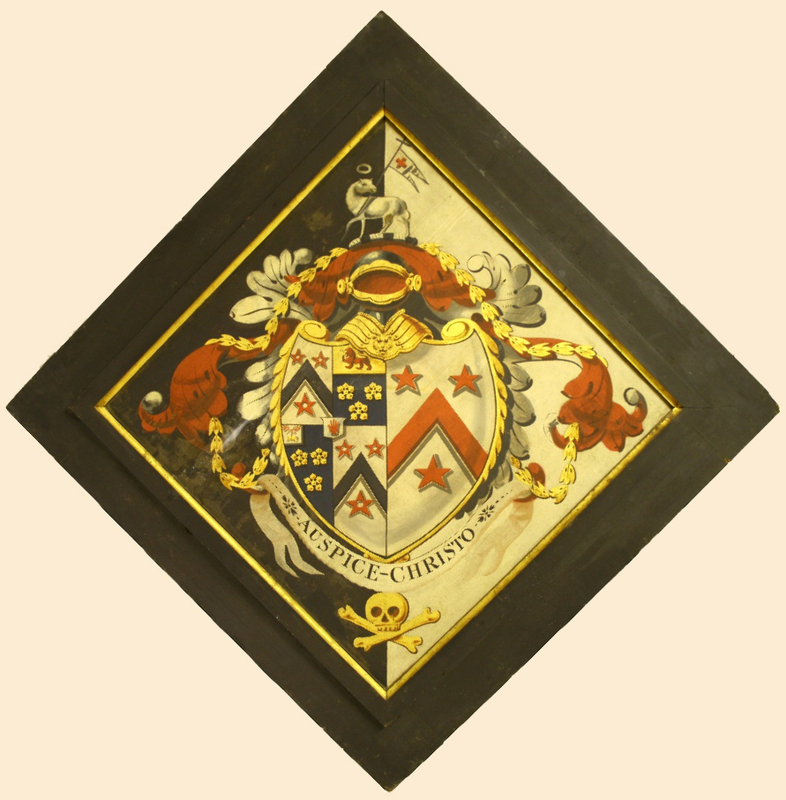 James Dempster, over at the HSS, spotted this hatchment on sale at ebay by timw3007. Crest: An arm embowed and couped at the shoulder erect from the elbow habited Gules cuffed ermine holding in the hand proper four leaves Vert. The hatchment was made by Winsor & Newton of London and is just 14 inches by 14 inches which is somewhat smaller that the usual. I could not find it listed in the Hatchments of Britain. These last two factors might indicate it was a “sample”. 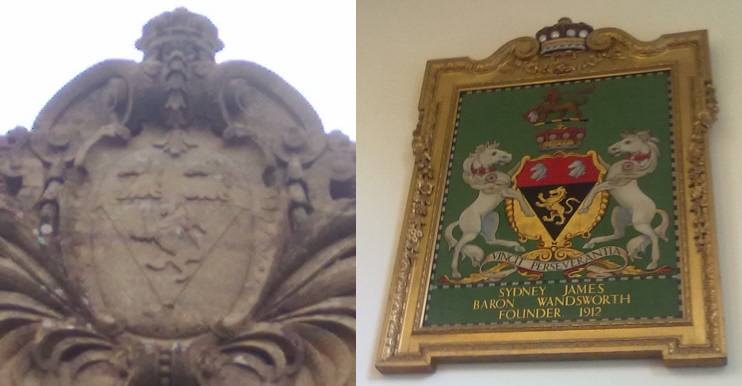 It appears that the TV astrologer, Russell Grant, is a Grantee of Arms from the College of Arms, London. Russell has his own web page on the topic here. To be absolutely sure I will need to have the actual blazon from the Letters Patent. I’ve dropped Russell’s “team” a line and await a reply. Failing that, I will have to try other avenues. Azure two seaxes in saltire pommelled and hilted Or between four estoiles two in fess of the last and two in pale Argent. I am sure some of my fellow heraldry enthusiasts can correct me. Arms: Or on a pile Sable a lion rampant of the first a chief Gules thereon two horse’s heads erased Argent. 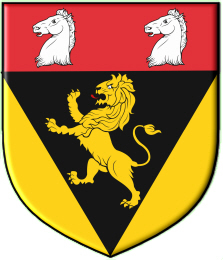 Crest: A lion passant proper gorged with a collar flory counterflory Gules resting the dexter forepaw on an escutcheon of the last charged with a horse’s head erased Argent. Supporters: On either side a horse Argent gorged with a collar flory counterflory and charged on the shoulder an estoile within an annulet all Gules. Supporters fol. 297). Lord Wandsworth died in 1912 without issue and the title became extinct. Originally from Germany at least three Stern brothers seem to have come to England, two via Portugal with titles of nobility.